Charlie Bears Kingdom Discounts Apply ! Designed by Isabelle Lee for Charlie Bears 2017 Bearhouse Collection. 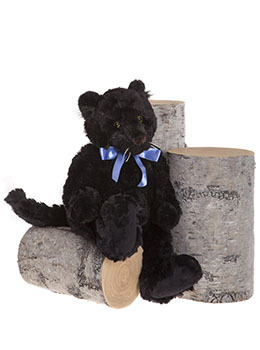 Kingdom our supersoft snuggly panther has a heathly black coat, chunky paws, bright eyes and cotton whiskers. He is softly filled and weighted to give extra cuddleabilityand like his friends Kingdom is machine washable and suitable for our collectors aged 18 months or older. He does have a small cub which has been designed to sit alongside him that you may want to look out for called Java. Comes with a numbered certificate of authenticity Attached, For Ages 18 months and above, Machine Washable, No Bag.